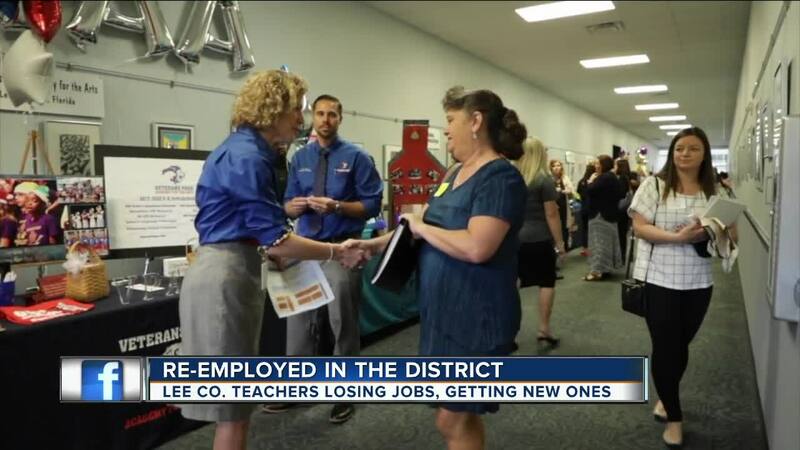 FORT MYERS, Fla. — Hundreds of teachers gathered in anticipation to fill teacher openings at the 2019 Spring Recruitment Fair in Fort Myers on Saturday. Diana Lauchu-Aikens was thrilled when the district offered her a position to teach English to non-English speaking students at Bonita Springs High School. “I’m ecstatic; I’m ecstatic. I want to go there and make a difference to students whose first language is not English," Lauchu-Aikens said. The fair comes at a good time when some teachers were notified in the few weeks their positions were not going to be filled next year. Angela Pruitt, Chief Human Resources Officer at Lee County School District, says they got the first pick. “We had about 150 of those [teachers] first thing this morning, and starting at 10 o’clock that was all of our, and that was about 350," Pruitt said. Pruitt said teachers have a variety of options to choose. “Everything like general elementary education. We’re especially interested in our secondary level in ESE teachers, math teachers, language arts teachers," she said. The district plants to hire 500 to 700 more teachers for the 2019-2020 school year. For information on positions at Lee County School District, click here .